Filed to: Get motivated!Filed to: Get motivated! Thousands crammed Fresno's Save Mart Center yesterday for a motivational seminar advertising appearances from Colin Powell, Rudy Giuliani and Joe Montana. This being Northern California, Montana was the big draw. He no-showed. I had the (mis)fortune of attending a Get Motivated seminar yesterday in Fresno. Joe Montana was scheduled to be a guest speaker, but amazingly didn't show up. However the event organizers decided Ronnie Lott would be a suitable replacement. For some reason, he decided that it would be pretty funny to get a hefty guy from the crowd and compare him to a center. 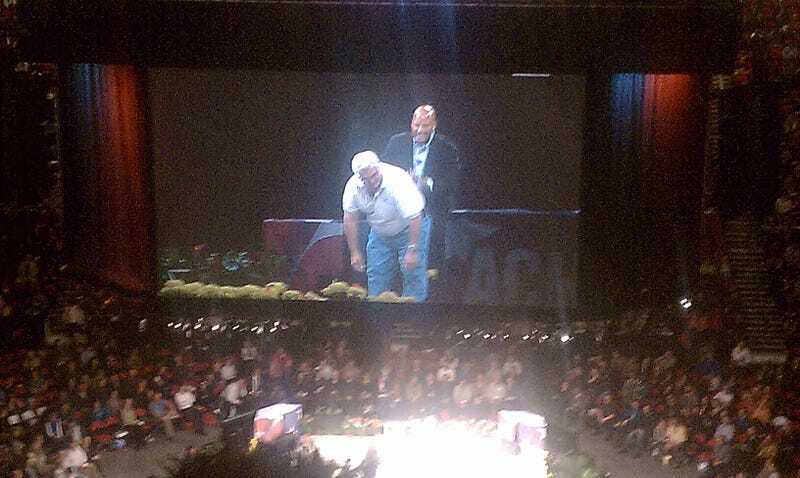 Which led to him bending this man over on the stage for about 3 or 4 minutes.